Ophrys heldreichii is a rather tall plant, which can grow to a height of 50 cm. The 4 – 10 large flowers have ovate-lanceolate sepals and triangular petals. 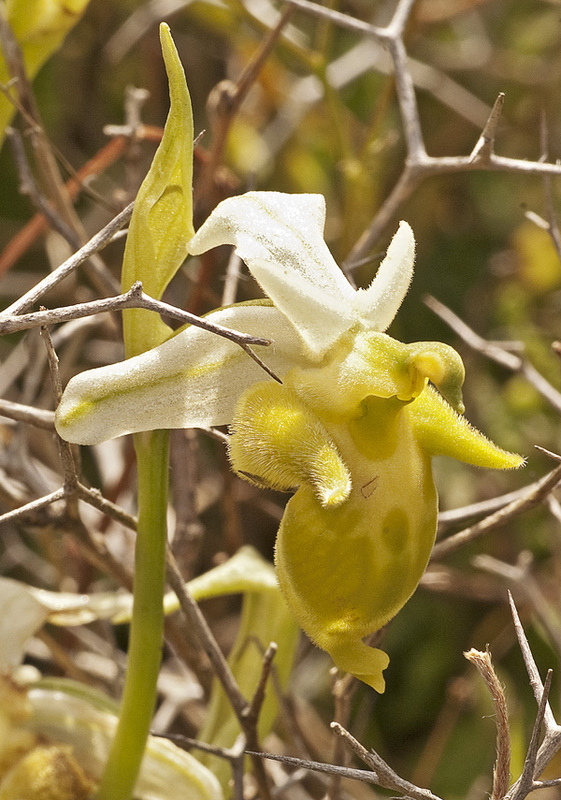 The labellum is three-lobed with blunt protuberances. The long middle lobe has a drawn-out and broad appendage. The plant was first described by the German botanist Friedrich Richard Rudolf Schlechter (1872-1925) who named it after the German botanist Theodor von Heldreich (1822-1902), who was the director of the botanical garden in Athens. Usually, Ophrys heldreichii has pink flowers with a with a dark brown labellum, the petals being darker than the sepals. All Ophrys species can develop hypochromic flowers with reduced pigmentation, “which is always spectacular” (Pierre Delforge, Guide des orchidées d’Europe). They are rare, and extremely rare in the case of Ophrys heldreichii. Ophrys heldreichii can be found on grassy phrygana on calcareous soils. Bloom is from March to April. The species can be found in Croatia, Greece and the Aegean islands, mainly on Crete.